Musical Recommendations: Guitar player Marc Ducret "(a fantastic musician. 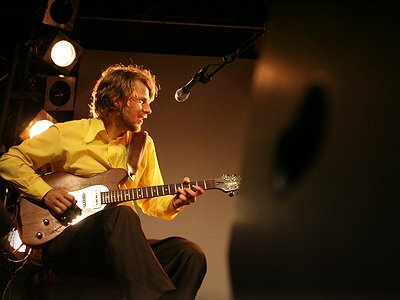 I saw his solo concert in Helsinki in a small bar a few years ago and that was a great experience". Composer Morton Feldman ("his music is timeless and beautiful"). I started with guitar at 11 after five years of piano. Besides going to lessons for classical guitar I also learned electric guitar at a music school for children. Beatles and Pink Floyd were my early influences, but I got into jazz and blues also fairly soon and was listening to Jimi Hendrix, Wes Montgomery, Freddie King, Robert Fripp and John Mclaughlin. I spent a long period learning basics. I wanted to learn as much about music as possible and studied jazz guitar and composition at the Sibelius Academy in Helsinki as well as at the Hanns Eisler University for Music in Berlin 1995-2003. At the same time I was playing in different jazz and rock bands and composing my own music. I noticed soon that studying can be good but also a bit dangerous if you are not on the quest to find your own voice. You might end up just copying others. At some point I decided to avoid sounding like any of my heroes, which was hard, but maybe helped me in my quest for an original sound. Berlin based Luthier, Frank Deimel has built me two electric guitars which he designed based on my wishes. These instruments are unique and have special features, for example piezzo pick ups that have their own output jacks. The instruments are combining different aspects I like about Fender and Gibson guitars. The sound of these instruments has definitely shaped the way I play. There are musicians and composers, Miles Davis for example who were really open to new sounds and constantly developing their music in new directions. That kind of openness has been inspiring. Also the fact that Miles challenged his own public with totally different kinds of music and shocked them gave me the feeling of liberty. My musical thinking was shaped by collective ways to create music that were typical for some classic rock groups. Some of these groups were really free and imaginative. These bands were sometimes more than a sum of their elements. This is not so typical in jazz and classical music where composing is usually done individually. To me for example Led Zeppelin and Can are examples of bands who created great music as a collective. When that unity was broken the individual members could never quite reach that height. I have always been searching musical partners with whom I can build a musical collective and found them in the groups like Klima Kalima and Johnny La Marama which have existed for about 15 years. Also my cooperation with Jimi Tenor goes over 10 years now. Collective work as it allows one to take different choices that would be possible as individual. First it was hard enough to keep any band together and get any work. There is so much music in Berlin that it is not easy to get chances to play as a new guy in the town. That took some time. Now the main problem is that most colleagues of mine are so busy that is hard find time to develop music. Also the joy and freshness of music is sometimes lost when music becomes a profession. Improvisation is instant composing. When composing in a classic way, the musician has more time to think about his choices. Improvisation is often most interesting in a group situation. Composing is often rather lonely work. Performing music is organising sounds in time. Space between the sounds is as important as the sound itself. Breathing is a good way to help to have enough pauses in the music: while breathing in, don´t play as Jiggs Whigham said. That is a good point by Bailey although not very poetic. I guess he wants to make choices that make many other choices possible. Those choices have to be fairly abstract to achieve this. If the musical choices are for example clearly tonal they don´t open endlessly transformable options. In this kind of improvisation Derek Bailey is very good. Sometimes material that is transformable in any direction and is abstract can feel cold and the lack of tonal melodies or clear rhythms become dogma in itself. Sometimes I as a listener need something definitive and not an open field. I think improvisation can be interesting also in tonal and groove oriented surrounding, both abstract and concrete musical worlds can be part of the same concert. The way Bailey is thinking makes sense as a way to search for new sounds and in the musical world where he was growing that was necessary but those times are 50 years gone and the world has changed in between. To me any dogma is boring. I am practising improvisation almost daily. I have practises and routines to work on how to manipulate or transform sound material. That can be melodies, rhythms, harmonies or timbres. There are also ways to practise hearing: to be able to hear and identify musical material other players are producing. Improvising with others is like a party where many things are possible, even dancing. "The joy and freshness of music is sometimes lost when music becomes a profession."